I love the taste of fresh picked raspberries, still warm from the sun. 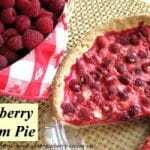 When I was a little girl, momma always maintained two raspberry patches – one red and one golden – and we spent many hours picking and preserving the luscious little gems. 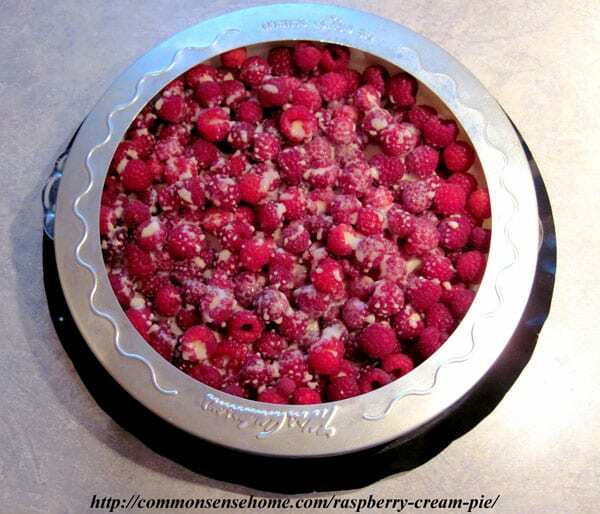 This raspberry cream pie recipe was one of my momma's favorites, which our family still enjoys. I've included a gluten free adaptation, which is shown in the photos. Gently lay crust into pie plate and crimp edges. I prefer a 9 1/2 inch pyrex pie plate. Place berries over bottom of crust. Combine remaining ingredients in bowl, mixing until blended. Pour over berries. Cover edge of crust during baking (to keep it from browning too much). (A pie crust shield makes this quick and easy, but you can also use foil.) Bake at 400 degrees, 40 to 50 minutes, until center is bubbling and edges are starting to set. Pie sets up as it cools. Keep refrigerated. Lovely served “as is”, with a bit of extra whipped cream on top or if you want to get really crazy, add some vanilla ice cream. Ready to go into the oven with pie crust shield to protect the crust and drip catcher tray underneath. Keep ingredients as cold as possible, and do not overwork your dough. This will help keep your crust flaky. Cut together flour and lard with a pastry blender to form pea sized bits. Mix other ingredients in a separate bowl, then cut into flour mix with a fork. Chill before rolling out between two sheets of wax paper or on a pastry cloth. Makes 1 pie crust. You may also substitute nut, coconut or shortbread crust. 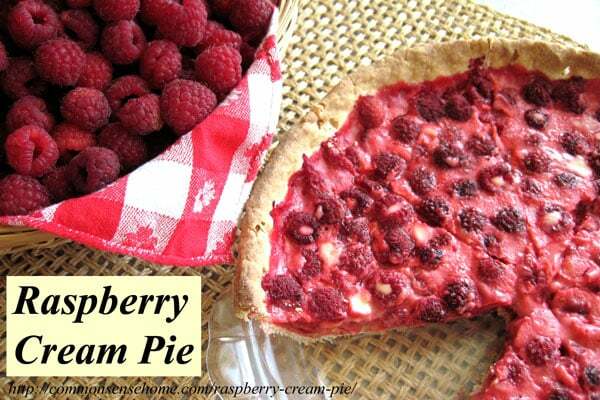 See other pie crust recipes. If you use a gluten free flour blend like Cup4Cup, the pastry will be much more difficult to work with and prone to breaking. Gluten adds elasticity to the dough. Gently lay crust into pie plate and crimp edges. I prefer a 9 1/2 inch pyrex pie plate. Place berries over bottom of crust. Whisk dry ingredients together, then add cream and vanilla and mix until blended. Pour over berries. Cover edge of crust during baking (to keep it from browning too much). (A pie crust shield makes this quick and easy, but you can also use foil.) Bake at 400 degrees, 40 to 50 minutes, until center is bubbling and edges are starting to set. Pie sets up as it cools. Keep refrigerated. Lovely served “as is”, with a bit of extra whipped cream on top or if you want to get really crazy, add some vanilla ice cream. I hope you enjoy this recipe as much as our family does. I'd love to hear about your favorite raspberry recipes. Gently lay crust into pie plate and crimp edges. I prefer a 9 1/2 inch pyrex pie plate. 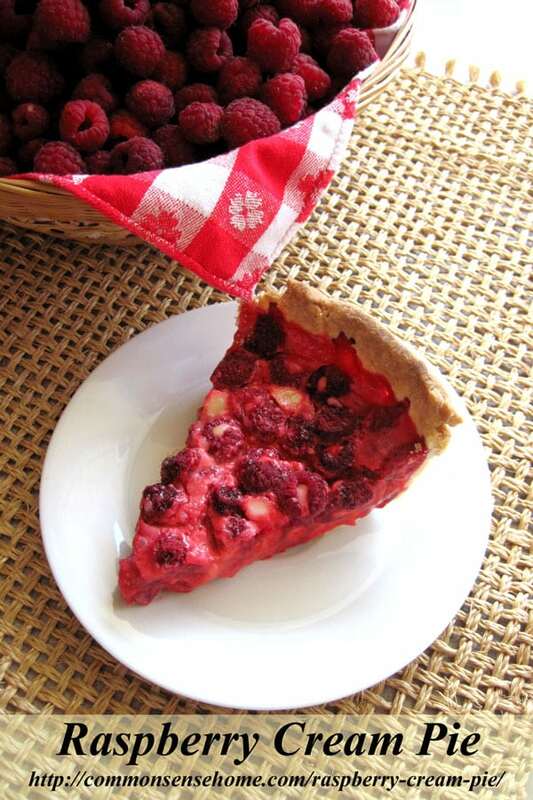 Place berries over bottom of crust. Combine remaining ingredients in bowl, mixing until blended. Pour over berries. Cover edge of crust during baking (to keep it from browning too much). Bake at 400 degrees, 40 to 50 minutes, until center is bubbling and edges are starting to set. Pie sets up as it cools. Keep refrigerated. Lovely served “as is”, with a bit of extra whipped cream on top or if you want to get really crazy, add some vanilla ice cream. You’ve made my day, too, Elaine. So glad I could pass the recipe along! Can this pie be frozen after it is baked? I wouldn’t recommend it. When thawed, the cream would break, making the filling runny. If you wanted to serve it frozen, and use a cookie crust, that might work.